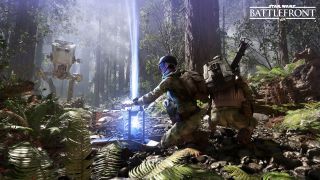 The first trailer for Star Wars Battlefront has been released. Why, there it is, right up there above this text, waiting to be watched! Boy, it's gorgeous, isn't it? So gorgeous and perfectly scripted and composed that it gives us very little idea of what it feels like to play Battlefront. I at least appreciate the tone: big, playful, and loud. Wes is at the Star Wars Celebration in Anaheim this week, and wrote all about the reveal this morning. We also learned that space battles won't be a focus and that the largest battles will involve 40 players.